I have been using Microsoft Security Essentials for the past 2 years. I think it is an outstanding Anti Virus program. It hasn't slowed down my computer unlike other programs I have used (AVG was a nightmare! ), and it seems to pick up on viruses quickly. It has popped up a few times during my Internet activity. I like the fact that it visually tells me that my computer is potentially unprotected by changing the castle colour in my System Tray from Green to Amber with a white exclamation mark. I also like the fact that it is east to use. I know how to run a Quick or Full Scan of my machine and I don't know computers too well. I only know from what I have learned in magazines and generally messing about on my computer at home. I would advise anyone reading this to ditch whatever Anti-Virus program you have a install Microsoft Security Essentials. 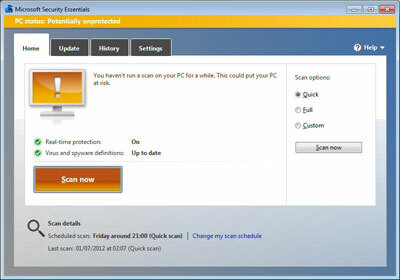 I am using Microsoft Security Essentials on a permanent basis and have absolutely no plans to change any time soon! I think it is simply the best program out there. Hello Donald. Thank you for sharing your thoughts on your own personal web page. I agree MSE is an excellent application. All too often Microsoft receive a bad press, ranging from insecure Operating Systems to 'Corporate Greed'. However, whether you think the negative press surrounding Microsoft is true or false, they have come up with a gem of a program is Microsoft Security Essentials. Other visitors to my site have commented on how poor the AVG free anti virus program is. For your information, I looked into this a short while ago and found there were lots of issues resolved in the 2012 edition. If you are reading this, please contribute to let me and everyone else know whether this is actually the case or not. Did AVG release a problematic application in the 2010 edition of their free anti virus program? Did the 2012 edition resolve some or all of the problems? Join in and write your own page! It's easy to do. How? Simply click here to return to Microsoft Free Anti Virus.